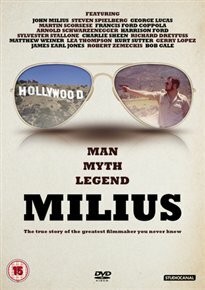 Profile of screenwriter and director, John Milius. A contemporary of Francis Ford Coppola and George Lucas during the 1970s, Milius’ fame as a screenwriter will forever be secured by the ‘Do I Feel Lucky?’ Clint Eastwood speech in Dirty Harry (1971) and the ‘I Love the Smell of Napalm in the Morning’ speech for Robert Duvall in ‘Apocalypse Now’ (1979). Famously out-of-sync with the liberal movers and shakers in Hollywood at the time, Milius’ forthright political views and controversial support of right-of-centre groups like the National Rifle Association led to claims that he was ‘blacklisted’ by his peers. Figueroa and Knutson affectionately trace the film-maker’s career with the help of contributions from friends and family and a host of Hollywood stars including Francis Ford Coppola, Harrison Ford, George Lucas, Arnold Schwarzenegger, Martin Scorsese and Oliver Stone.